This is a La Niña year which in Seattle usually means cold and snow. In the fall, there were dire predictions about how much of the white stuff we were going to get. Randy and I even contemplated adding snow tires to our SUV just so we could get around. Alas, what we have gotten is warmer than usual temps and lots and lots of rain. Rain is nothing new in Seattle. I grew up here and winter means rain around these parts. Still, by the middle of February, I start to feel a little desperate. Yes, the days are noticeably longer and I see a few pink blossoms on the cherry trees, but gray is still the color and going to the park means getting drenched. I do my best to cook seasonally and I scoff at people who buy asparagus in November. But I just needed me some green and so these (very beautiful, I must say) asparagus went into my cart. As is often the case when I have a vegetable I want to feature but no specific plans, I made risotto. Visions of lots of lemon and lemon thyme (which is still growing in my yard) were dancing in my head until I realized I had no lemons. I’m not sure how that is possible, I always have lemons, but an adjustment had to be made. What about orange? 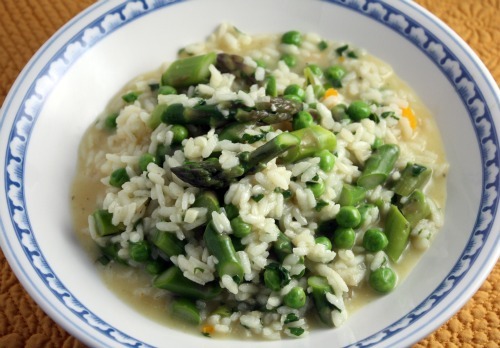 It turns out that the zest of one orange grated into a pot of asparagus-y pea-y risotto brought winter and spring together deliciously. A word about the method. Until recently, I made risotto the traditional way – adding small amounts of broth into the rice and constantly stirring. A few issues ago, Cook’s Illustrated tested out a different less hands-on way to make risotto and I have never looked back. By the way, I am teaching a brunch class on Saturday, April 2nd and Sunday, April 3rd. Come join me! Put the stock in a medium saucepan and bring to a simmer. Turn heat to low. Boil water in another medium saucepan. Add a large pinch of salt and then stir in the asparagus. Cook until just crisp-tender, about 3 minutes, then immediately transfer the asparagus to a ice water bath. Allow to cool completely, then drain. Heat a large sauté pan over medium heat. Melt the butter then add the shallots along with a large pinch of salt. Cook, stirring constantly, until starting to soften, about 3 minutes. Add the garlic and orange bell pepper and cook for another 3 minutes. Add the rice and stir well to coat with the fat and vegetables and also to toast it slightly. Pour in the wine and stir constantly until the wine is absorbed. Pour in most of the vegetable stock, holding back about 1 cup of it. Stir the pot vigorously for 1 minute. Cover and reduce heat to low. Cook for 15 minutes, stirring vigorously just twice. Uncover and add the asparagus, peas, cheese, and herbs. Give it a good stir and add a bit of stock at a time, stirring constantly, until the rice is al dente. 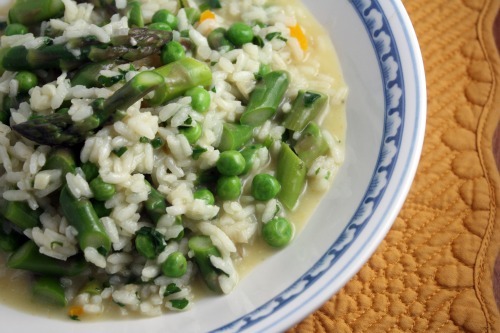 You want a decent amount of liquid in the risotto – not so enough that it is soup, but not dry either. Season to taste with salt and pepper. By the time you read this, I am going to be on the lovely island of Kauai. Before you hate me too much, the weather forecast at this point in time is for rain the entire 9 days we are there. We went to Kauai two years ago and literally was sunny for 6 hours out of 7 days. Still, the beauty there is unsurpassed and they make a mean fruity rum drink and our kids are now old enough to go to the Kid’s Club the resort offers. This is the first time traveling with them where we are bringing no diapers, wipes, or strollers. It is also the first time I have not been filled with dread over a flight with boys. We boarded armed with two Leapsters, an iPad, two DVD players and enough snacks to feel the plane. I have a food post planned but in the mean time, here is a glimpse into my life this February. First off, I am so excited about this little gem. We will be staying at a condo in Princeville which has a decent kitchen. I love being able to make something for dinner occasionally when on vacation. Don’t get me wrong, I love going out to eat, but I start to miss healthy cooking after a few days. 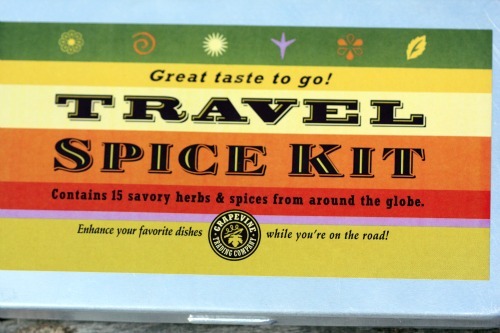 The problem is, you are usually left with either underspiced food or having to shell out close to $20 for a couple of jars of spice. Here, the problem is solved. 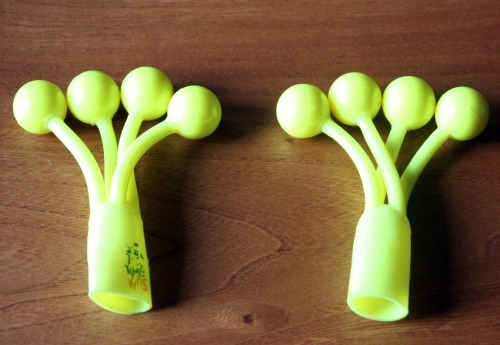 I got undressed the other night and found these in my pants pockets. They had been there the whole day. 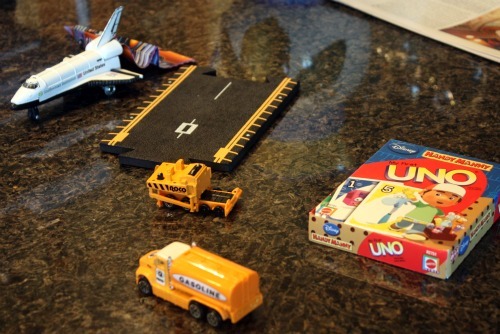 My kitchen island is almost always littered with various vehicles, no matter how many times I ask the boys to keep them downstairs. Among the more expected contents of my purse (wallet, keys, etc. 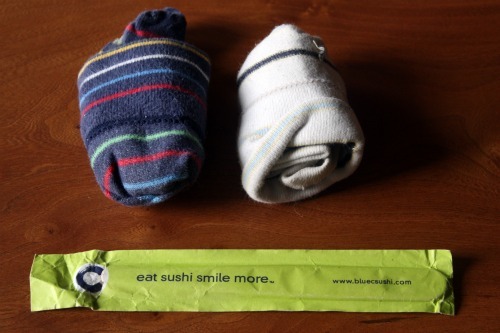 ), I found two pairs of socks and a pair of kids chopsticks. There were also a few fire trucks and a small digger, but those had been fished out to entertain the boys earlier in the day. I am proud to say there was no old string cheese hiding in there. Not that that has ever happened to me. We can bring in a treat for kids’ birthdays at Spencer’s preschool, but they must be store-bought. The thinking is that if someone gets sick, they can trace the source. I told Spencer he could pick out which ones he wanted and he picked these beauties. 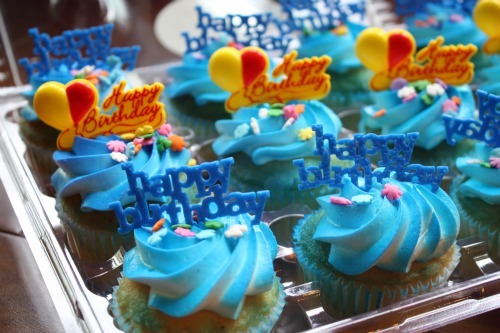 Don’t think it did not physically pain me to bring in neon blue crap-filled cupcakes. My reputation! This is my neighbor. He is doing a little construction project. Yes, he and his wife live there. The house has looked like this, or worse, for the 4+ years we have owned our house. 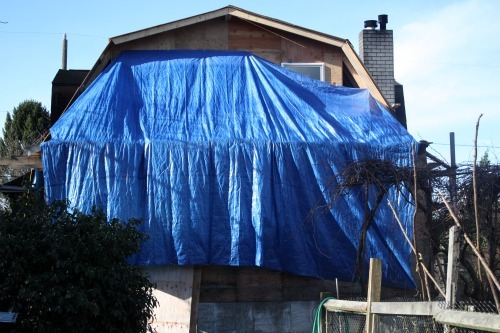 The blue tarps look so nice offset against the (rare these days) blue sky, don’t you think? And the whipping sound they make when the wind blows is so soothing. First things first. 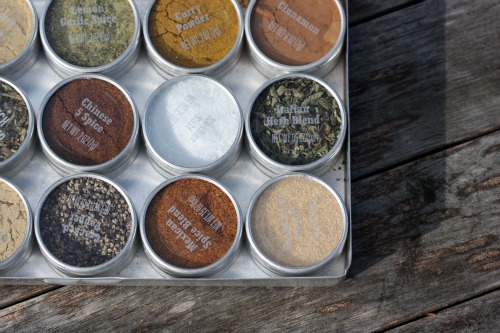 I think I am going to ask you all what you would do with ingredients more often! The uses you came up with for those pickled raisins were amazing! Curried carrot dip, on top of pizza with Gorgonzola, baked in squash with couscous and pistachios – I want to make everything. The winners, picked randomly, are commenters #26 and #18. Bebe would put them in chicken salad and Stacey would put them in anything with cauliflower. Congrats ladies! Contact me soon to get your raisins. It has been a busy couple of weeks in my kitchen. Since the beginning of the month, I have taught three classes, cooked a yoga dinner for 24, made a birthday cake for my younger son, and baked cupcakes for my older son’s class. When typing that out, it doesn’t look like all that much. But it was a lot, especially coupled with regular old everyday life. At the end of a long stint of cooking, I sometimes feel like I am done with it. The thought of chopping anything, turning on a burner, bringing butter up to room temperature, cracking an egg – just too. much. effort. But then my husband goes out of town and a friend brings her kids over for dinner, and I realize what I really want to eat for dinner is not take-out but my cooking. And so, back into the kitchen I go. 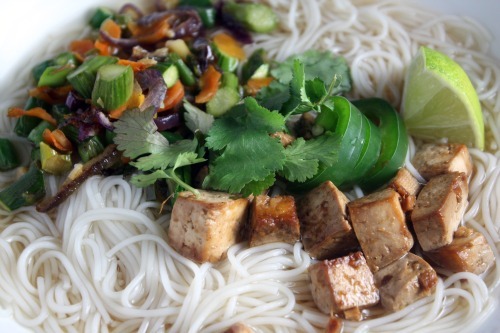 This Asian-noodles-in-a-broth-with-tofu idea is not new on this site. It is one of my favorite things to eat in the world. Each time I make something like this, it is a little different. I glanced at a recipe from Deborah Madison to get me going in a slightly different direction than I would have if left to my own devices. Then I totally made it my own. 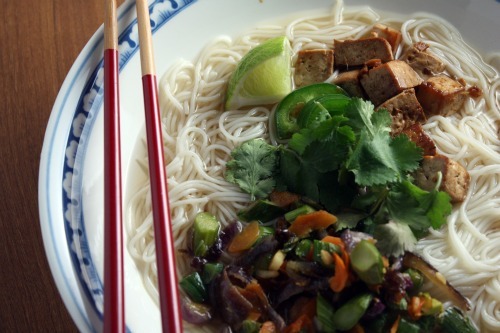 As with most Asian noodle dishes, soups or otherwise, I would eat this every night without complaint. If it is still frosty in your part of the country, a bowl of noodle soup warms you like no other. But this is light and fresh enough to taste right even if your city is thawing. This recipe might look a little complicated but it is actually quite quick to make. You can always double the broth and freeze half for next time. Somen noodles are very thin wheat noodles found on the Asian aisle of your supermarket. Feel free to use different vegetables in the mix – snow or snap peas would be great. Mix together the marinade in a medium baking dish. Taste, making sure the balance is to your taste. You want it to be salty, sweet, and slightly sour. Stir in the tofu, coating well with the marinade. Allow to sit out at room temperature for 30 minutes, tossing occasionally to make sure the tofu is coated with the marinade. Place in the oven, uncovered, and allow to bake until all the marinade is absorbed and the tofu is getting a slight crisp to it, about 35 minutes. Toss the tofu once or twice in the baking process so that all the pieces come into contact with the pan. Remove tofu from the oven and allow to cool. Bring a large pot of salted water to a boil. Add the somen noodles and give a good stir. Watch the pot so it doesn’t foam over. Cook the noodles until they are almost done, with just a slight bite, and drain. Rinse well with cold water, drain, and set aside. Heat a large skillet over medium heat. Add just enough vegetable oil to coat the bottom of the pan. Add the red onion and sauté until starting to soften, about 5 minutes. Add the garlic, jalapeño pepper, and ginger and cook for another two minutes, stirring constantly. Add the green beans, carrots, and asparagus and continue to cook, stirring often, until the green vegetables are crisp tender, about 5 minutes. Place some noodles in the bottom of a deep soup bowl. Ladle on the broth. 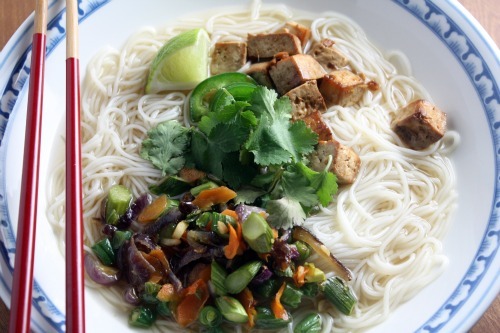 Add tofu and vegetables and garnish with cilantro, lime, and jalapeño pepper slices. I really really try not to be, but sometimes I am a picker. You know, dinner is over, you are stuffed. And yet the remnants of the meal are beckoning to you. And so. You pick – find the bites with your fingers that are the most tempting. Recently, I made a pasta that starred many of the things you see here. And it was good. But when all was said and done, I picked at the cauliflower. Ignored the pasta all together, nudged it aside, so I could get to the tangy, slightly sweet, savory, and spicy cauliflower. Clearly this vegetable needed star billing. So, I made it. I sautéed garlic – more garlic than this somewhat garlic ambivalent person usually does. I added a full teaspoon – maybe more – of red pepper flakes. I added some chopped up caper berries because a dear friend bought me some for my birthday and a small handful of kalamata olives. I wanted raisins and I remembered that same friend gave me some pickled raisins (swoon!) and tossed a couple tablespoons of those. Acid was needed so in went half a can of crushed tomatoes. 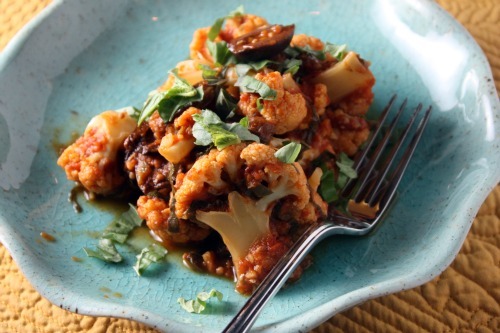 And, of course, the cauliflower. My mom used to make steamed cauliflower when I was a kid. I ate it because she made me. This is not that cauliflower. Randy sometimes imagines he doesn’t like cauliflower. He loved this. You could certainly add pasta and have a knockout dish. But you don’t need it. These raisins. I have to give some away. Maybe you are thinking – raisins? As a giveaway? 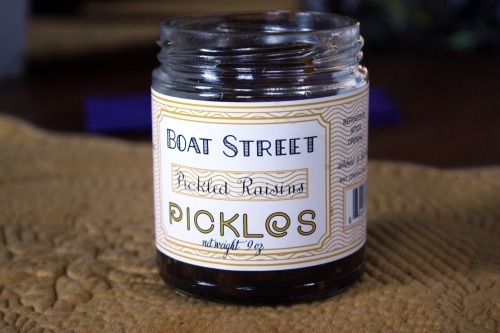 Well, if you are a fan of things pickled, you will love having these in your pantry. They are a local treat, made by the good folks at the Boat Street Café. I will send two winners each a jar. Just tell me what you would do with them! Winner will be picked this Sunday. If you are not a big fan of spice, you can dial the red pepper way back here. I wanted to add toasted pine nuts to the finished dish, but I was out. I think they would be terrific here. Heat a sauté pan over medium heat. Pour in the olive oil, swirl it around, then add the garlic. Sauté, stirring constantly, and once it is golden, add the red pepper flakes, capers, and olives. Be careful that the garlic does not burn. Add the cauliflower, give everything a good stir, then pour in the wine. Allow to cook, uncovered, until the liquid is reduced by half. Stir in the raisins and the tomatoes. Turn the heat down to low and cover. 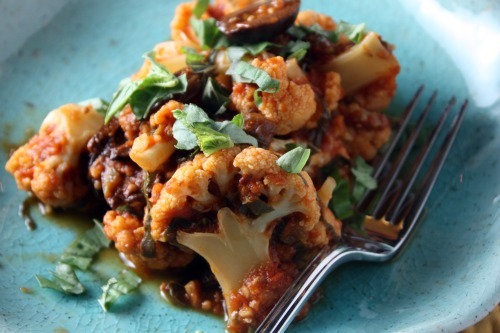 Cook, stirring occasionally, until the cauliflower is fork tender – about 10 minutes. Stir in basil and serve warm. Here is where I admit that up until a couple of days ago, I had never eaten a cannoli. My parents were both born and raised in New York and they had the luxury of eating things like real bagels, good profiteroles, late summer tomatoes, and cannoli. My mom has a cousin who used to come visit us every summer and they would bring 4 dozen bagels with them to store in our garage freezer. I’m sure that if the other things on that list weren’t so perishable, my mom would have requested she bring those too. So, cannoli were not a part of my childhood. If I were the type to go nuts over cheese in my desserts, I would have made them long ago. 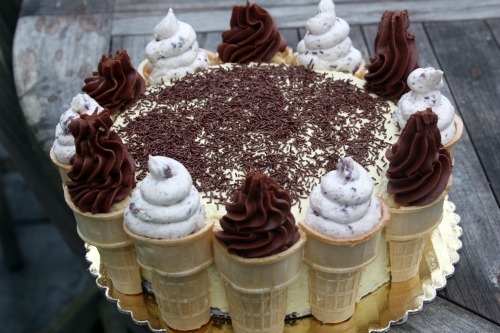 But truthfully, this is not my kind of treat. If you are a regular here I think you know what my kind of treat is. But I am telling you about these cannoli for several reasons. 1) Someone at Saturday’s yoga retreat sat me down and said, “If you do not post the recipe for these cannoli, I will never speak to you again.” Strong words. 2) One of my new favorite “Food and Graham” stories happened while preparing these. I don’t mention this often enough but Graham is a great eater. He has a huge appetite and really loves food. He is eager to try new things. Something he hasn’t seen before makes him wonder what it tastes like. Spencer‘s response is the opposite. Anyway, I was chopping crystallized ginger for the filling and Graham asked for a taste. I gave him a cube of it, he took a little bite, and then asked for three more pieces. 3) I got this recipe off Epicurious. Our computer is in our study which is not right next to the kitchen. I was the end of a LONG cooking day when it came time to prepare these. I took a quick glance at the recipe and then went back to my food processor to finish it. I had a nagging suspicion that I had forgotten something in the filling but was too lazy to go back and double check. Finally, once the filling was in the bowl, I took a quick taste and thought it was fine for, you know, a cheese filling, and into the refrigerator it went. Then I checked the recipe. Sugar. I didn’t add the full 2 cups of powdered sugar that the recipe called for. I tasted again. I’m no expert, but cannoli are not supposed to be super sweet, right? It tasted just about right to me and everyone loved this without the sugar. So there you go. Cannoli. Discuss. Now. 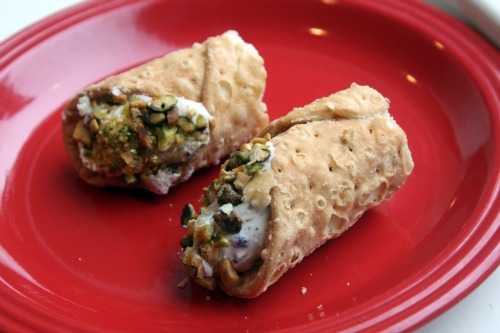 The recipe makes enough filling for 25 regular size cannoli. For reasons that are too boring to explain, I only bought 12 shells. 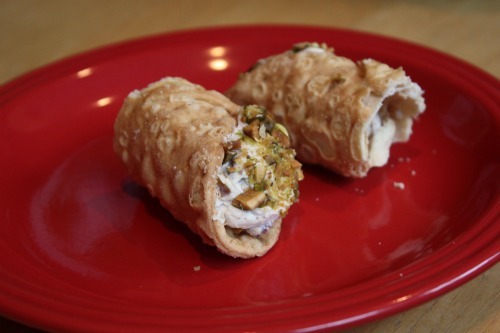 I cut each cannoli in half so everyone could have one but I still had tons of leftover filling. I brought it back home with me, wondering what I was going to do with it. And then, an unexpected opportunity came my way. This is Spencer’s birthday cake. Once again for reasons that are too boring to explain, I did not make enough frosting. 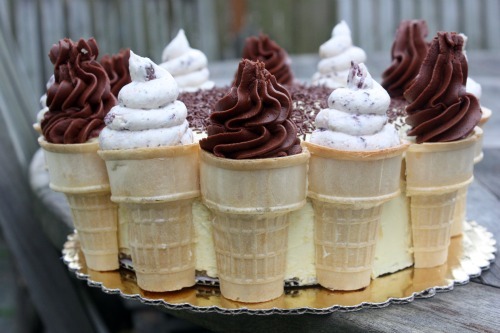 I was left with just enough to very lightly frost the outside of the cake but not enough to frost all of the cones. (The chocolate you see is the buttercream mixed with melted chocolate.) As I was contemplating driving to the store to buy some frosting in a can (shudder), I remembered my leftover filling. So that is what is adorning half the cones. And now, back to the cannoli. This recipe originally called for dried cherries but I only had cranberries. If you would like to add the sugar that I forgot, add two cups – one in each batch. Working in batches, transfer filling to pastry bag without tip. Pipe into shells. Dip ends in chopped pistachios. Chill at least 2 hours and up to 6 hours.